But this blog is not about Hemingway’s conflation of masculinity with the aims of the country he believed was best defending Spain, Spain being his adopted homeland. Rather, this blog continues the theme of my recent essays, that of populist demagoguery and the widespread reluctance to get to know our deepest thoughts and impulses, to the detriment of our own capacities for free thought. It is the contention of this blog that demagogues harness our own unspoken and unacknowledged, possibly divisive, thoughts and feelings, directing them instead to a designated enemy who must be defeated to purify ourselves of contaminants, contaminants that would infect the Good Mother(land). First, a few words on the text and subtext of HOMELAND (see http://en.wikipedia.org/wiki/Homeland_(TV_series)) . The thriller was ostensibly inspired by Hatufim, an Israeli television series shown in 2010, treating the hitherto neglected subject of returning prisoners of war, whose adjustment to family life was often fraught with difficulty, not to speak of some suspicions of their continued loyalty to the homeland. I find a more persuasive precursor to HOMELAND in the American series 24, that dealt with counter-terrorism, with some questioning the morality of its chief character “Jack Bauer,” whose methods subordinated means to ends. Similarly, the chief argument of HOMELAND is that Americans, while ostensibly fighting the war on terror, committed atrocities (i.e., “collateral damage”) that were covered up by highly placed officials such as the Vice-President (obviously linked to Cheney and his advocacy of American power and a militant response to 9/11) and his confederate, a highly placed officer in the CIA, who obliterated the record of a drone attack that took the lives of 82 children in the attempt to kill a major figure in Al Qaeda, “Abu Nazir.” Nazir’s adorable 10 year old son Isa is one of the casualties, and this tragic loss leads Nazir to wreak revenge by attacking the entire U.S. defense establishment, using “turned” POW Nicholas Brody as his fifth column. Season one ends with Brody’s suicide bombing attempt undermined by his own “Achilles heel” (i.e. Fifth Column): his attachment to his 16-year old daughter who pleads with him to come home to his true homeland, where he is needed as a loving and protective father. One of the virtues of the HOMELAND series is the moral ambiguity it attaches to the actions of each of the major characters, but make no mistake: taken in all, it is a strong antiwar, anti-Republican Party statement on current controversies regarding the use of “American power” that puts “America First” rather than respecting the good Muslims who are sprinkled throughout, and who would suppress the terrorists given a more internationalist approach of the U.S. in the wake of 9/11. Republicans cannot just enjoy something… everything has to be analysed for ideological purity. I am no ideologue Richie, and am barely a Republican. Perhaps you would prefer animal enjoyment of a sometimes exciting television series? Main character in 24: “Jack Bauer,” not “Jack Ryan.” “Jack Ryan” is the main character in many of Tom Clancy’s novels. Great post. 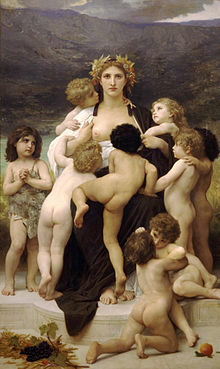 Loved the end reference to Bouguereau. An under-rated 19th century master.